Are you sure you’re feeding your pup the best dog food for Poodles? Every dog lover wants their furry loved ones to flourish, thriving off a top quality diet nature intended! Sadly, very few dog foods actually live up to these standards. Exactly how good is the food your dog is eating? In a 2016 study, a whopping 53% of pet dogs were classified as clinically overweight. There are an estimated 41 million overweight dogs in America alone. 1. Let Your Poodle Thrive! With today’s world of marketing and sales gimmicks, selecting the best poodle dog food can be pretty confusing. With over a hundred brands out there, how in the world will you decide which one is the best for your Poodle? Learn exactly how to choose the best food for your pet here! Knowing what to avoid is your first step. Many extremely popular poodle foods use some of the cheapest ingredients possible, sadly investing much more effort into advertising than the nutritional value of the food itself. In 2016, American pet food sales reached 28.23 Billion dollars! Companies make more money if they can sell more of a cheaper product. Where corn isn’t exactly bad for poodles, it isn’t very good either. Corn actually offers very little nutritional value at all. So why do manufacturers use it? Corn is very cheap and easy to grow, whereas animal meat, making up 95% of a dog’s natural diet in the wild, is more costly. By using corn, manufacturers are able to produce a much cheaper product and maximize their profits. Take a minute to look at the nutritional label on the back of your dog food container. If any one of the first three ingredients listed are corn based, it is probably pretty low quality. When animals are slaughtered for human food production, the remaining carcass often becomes animal food. If the avg. poodle owner knew what went into their dog food, they would be sick. In fact, it isn’t uncommon for manufacturers to render decaying carcases of other animals, even euthanized pets, when producing their foods. Rendering: Ingredients are grinded then cooked at high temperatures in gigantic industrial vats, converting waste animal tissue into useful products. Meat By-Products: These are clean, non rendered ‘parts’, other than meat, derived from slaughterhouse animals. This could include lungs, spleens, kidneys, brain, blood, bone, fatty tissue, stomachs and intestines. Meat Meals: Meat meals can be either good or bad, depending on the source. All of the animal’s tissues (blood, hair, hoof, horn, hide, stomach contents, etc.) are rendered together (see ‘Rendering’ above). In the wild, a wolf’s natural diet is made up almost entirely of animal meat, with very few plant sources. The same goes for wild dogs (ex. African Wild Dogs). All of today’s domestic dogs are descended from wolves, and their nutritional requirements haven’t changed much. The only reason plants and plant based sources are used so heavily in today’s animal feed is they are cheap. Other than a few vitamins and minerals, dogs don’t need them. Dogs get the perfect mixture of just the right kinds of nutrition from animal meat. The best dog food for poodles should list some type of animal meat among their top ingredients, preferably at least two of them. Recommendation: Don’t listen to television advertising or what your friends have to say. The only way to be sure you are truly giving your pet the best possible diet you can is by educating yourself. It only takes a few minutes to read an article, but your poodle only has one body. The example here is one of the absolute worst dog foods in the market today. The manufacturer couldn’t produce a cheaper product while meeting the absolute minimum nutritional requirements. Unfortunately, it is also one of the most popular products on the market, earning millions worldwide. Very few poodle owners haven’t heard of this brand, and the majority of them use it. This product is the perfect example of what to avoid. Whole grain corn: Corn is very cheap and easy to produce, basically little more than a ‘filler’ to make a dog feed seem like more than what it is. It’s listed as the very first ingredient and used more than any of the other ingredients. Meat & bone meal: A Meat meal could be absolutely anything. Any part of the animal (very likely the entire animal) is fair game. In this case, bone was also grinded and rendered together with the ‘mystery meat’. Specific meals, like ‘Chicken Meal’ or ‘Turkey Meal’ are not nearly as bad as ‘Meat Meal’. Corn Gluten Meal: Again, a very cheap ingredient with a very low nutritional value. Gluten is the rubbery residue left over after corn has had most of its carbohydrates washed out. Animal fat: Animal fat is a generic by-product of rendering, the same process used to make meat meals. Chicken by-product meal: By-products are not actually meat. This could include any part of the chicken (feathers, organs, etc). What is this dog food described above, and why is it so popular? You’re looking at Purina Dog Chow, so popular because it is one of the least expensive meal on the shelves. No ‘meat meal’, corn products, or by-products are included among the top ingredients in any of these feeds. All poodle foods listed here were given an A rating by Dog Food Advisor, one of the best dog food rating sites on the web. For more information about home cooked feeding, check out Feeding a Poodle! 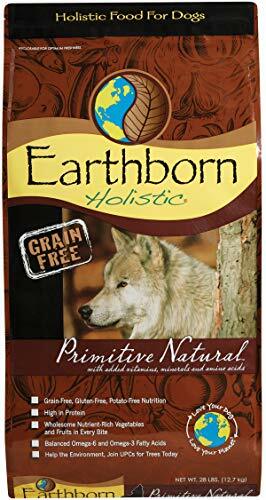 Not only is this one of the best dog foods for poodles on the market, Earthborn Holistic offers a wholesome approach to dog feed with a wide variety of top quality ingredients. With ingredients like turkey, chicken, whitefish and eggs, you couldn’t go wrong! Earthborn Holistic includes high quality sources of animal protein in three out of the top five ingredients, and then again many times over! For poodle owners who want to go a more holistic route, Earthborn Holistic is a great option! Tomato pomace, a by-product of tomato rendering, is used. Orijen doesn’t stop at simply grain free. 38% high quality protein, most coming from chicken and turkey, set Orijen apart from the competition. On top of this, Orijen is packed full of vitamin rich vegetables. Fisherman, farmers and ranchers all connect to help provide the best possible ingredients for your pup! Orijen receives five star ratings in not just one place, but across the board. It’s hard to find a critic who didn’t give Orijen top marks. 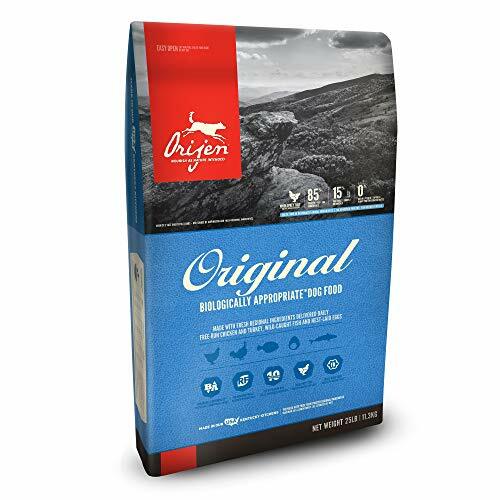 If you want the very best feed for your dog you can find, Orijen is the way to go! Inspired by the diet of wolves, Blue Buffalo isn’t just a top name in dog food for poodles. Blue Buffalo offers a protein-rich, grain free diet in all their feeds. Blue Buffalo is made with only high-end, top of the line ingredients, skipping those useless fillers many other brands use. 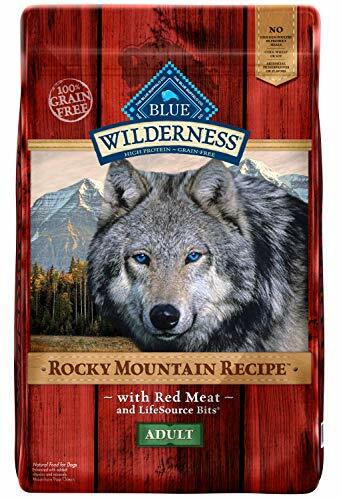 With deboned salmon and chicken meal as their top two ingredients, Blue Buffalo Wilderness makes meat protein a priority. Further down the line they provide more sources of fish and eggs, giving the omega fatty acids dogs need to flourish! Chicken meal is a rendered mixture, which could be considered good or bad. 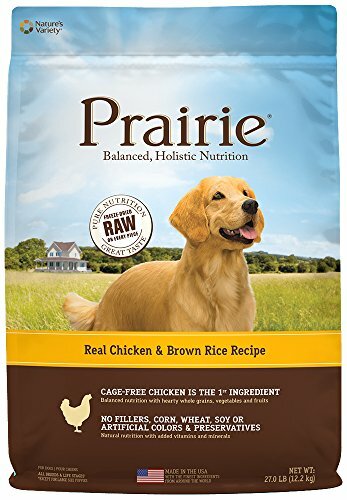 Nature’s Variety Prairie is another holistic take on dog meals. With a focus on high valued Salmon, Nature’s Variety not only offers high quality protein, but plenty of the Omega fatty acids fish are known for! 1. What should you feed a poodle? This depends on your preference, but the options above are your best choices. Dogs were naturally intended to thrive off of a diet rich in animal meat. The dog foods listed above provide the best concentrations of animal protein, vitamins and minerals. Try to avoid feeds listing by-products or corn (a popular filler) as their first ingredients. 2. How much should a standard poodle puppy eat? Puppy feed is designed to offer more calories and a higher protein content for growing puppies. Most importantly, poodle puppies should eat ‘puppy food’, not adult dog feed. The serving size might be different depending on what meal you choose, so always refer to the serving sizes on the back of your puppy food container. Changing a puppy’s diet suddenly can cause digestive problems. If you don’t like the original food the breeder was feeding your puppy before you got him, try to slowly introduce a new food. 3. How often should you feed a poodle? Follow the recommended schedule on the back of your dog food container. That being said, very young puppies, under the age of 3 months, do best if they can ‘free feed’. Poodle puppies 3 months and up should be offered three meals a day. Adults can either go with 1 or 2 meals daily, but it’s best to refer to your dog food manufacturer’s recommended dose. 4. How do I switch dog foods/brands if I don’t like this one? Suddenly switching feeds can cause stomach upset and digestion problems in some dogs. If you don’t like your current dog food and want to switch, it’s best to do it gradually. For puppies, follow the table above in question #2. For adults, you can shorten the schedule by half. 5. What about Miniature Poodles? Because they are only capable of taking swallowing smaller portions, small dogs should be given ‘small dog food’ that they are easily able to chew and digest. Because they are smaller, toy Poodles won’t need to consume the amount of calories a larger breed does. Video: Dog Care & Breed Information : What Do Poodles Eat? Though all of these foods for poodles are fantastic, Orijen is probably the best dog feed for them out of them. What do you feed your Poodle, and how has it been working for you? Please, feel free to leave your thoughts and opinions in the comment section below!